In 2014, The Ivory Foundation supported a research activity in the Botswana University of Agriculture (BUAN) in Gaborone. The BUAN (ex BCA) is an associate Institution of the University of Botswana. BUAN has a confirmed reputation and significant regional influence. 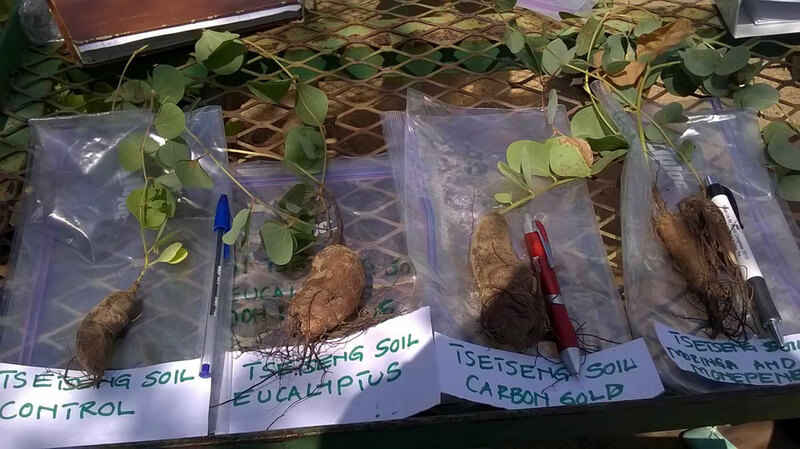 The purpose of the research focuses on the effects of biochar technology, particularly on poor soils, such as those of the Kalahari Desert, which are both sandy and salty. Biochar is a solid material obtained from the carbonization of the biomass. It has the ability to improve soil fertilityin order to give higher yields. Once produced, Biochar can be finely ground and spread on crop and incorporated into the top layer of soil. The Ivory Foundation also funded the implementation of a burner of biochar within the premises of the BUAN, with the aim of conducting scientific experiments. Two more burners have been funded and set up in other parts of the region, in order to effectively experience this innovation within vulnerable communities and measure the expected improvement on crops. A partnership has also been set up with the Okavango Research Institute (ORI), located in Maun in northern Botswana. ORI assists farmers and tests technical cultures with an ecological imperative in this protected and sensitive flood zone. The Institute will also be responsible to experience Biochar in association with elephant dung.